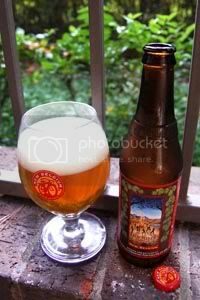 New Belgium introduced a new fall seasonal this year, Hoptober Golden Ale. It is pitched as "a veritable cornucopia of the earth," which is rather fitting given the season. As the name implies, the beer is a more hop-focused effort than the average fall seasonal, and what New Belgium usually produces. Golden Ale is not an official style, but is generally interchangeable with the American Blonde Ale style, so I've listed it as such )even though it doesn't exactly seem like the best match). As for its construction, the backbone is a mix of pale malt, wheat, rye, and oats, while Centennial, Cascade, Sterling, Willamette, and Glacier hop varieties are employed. Sounds like a wonderful mix for a fall evening such as this, so let's dig in, shall we? Appearance: A crystal-clear, golden-amber body capped by a little over a finger of near-white head that features good retention and lacing. Aroma: Citrusy and tropical-fruity hops over a biscuity malt body. If you'd presented this to me as an India Pale Ale, I wouldn't have thought twice based on the aroma. Taste: Moderately bitter, green, and citrusy hops up front. Underneath, a toasty, biscuity, and caramel-like malt body keeps everything nicely balanced. The aftertaste is citrusy, a little leafy, and biscuity with a nice bitter kick. In the flavor department it ends up resembling a Pale Ale, rather than an IPA. Mouthfeel: Medium bodied and slightly creamy with good carbonation. A dry finish. Drinkability: A very quaffable brew that would be make for a great session choice. Verdict: It's always nice to see New Belgium playing on the hoppier side of the spectrum, and Hoptober ends up being a tasty, easily drinkable, and cheerful little beer. Note: While this review is being published in November, the tasting notes contained within were taken when the beer was fresh this past September.